I have finished ordering though here for the coins, but I know that Kiddercorp has extra colour and regular coins for sale if people would like them. Please contact them directly! All colour coins of the first run have been sold out! There are still regular coins available! 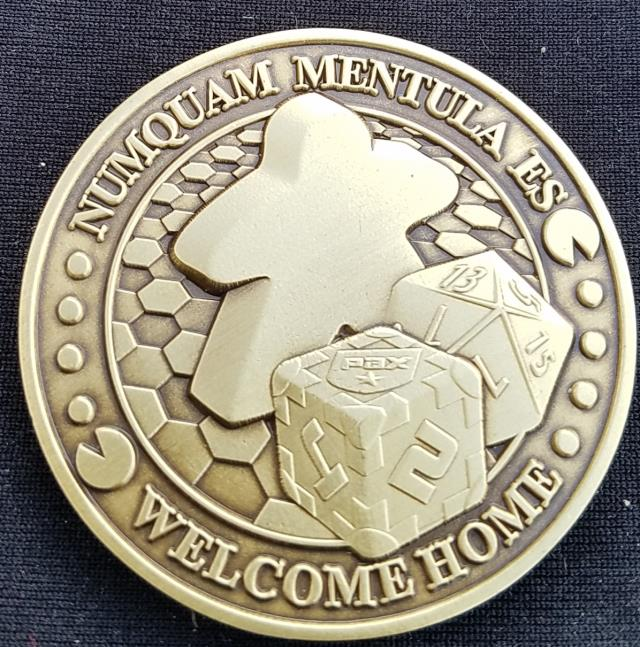 You may still order colour coins and if we get enough interest, we will make a second run! What should the finish be? Option 3 has won with 77.6% of the vote! Hello all! 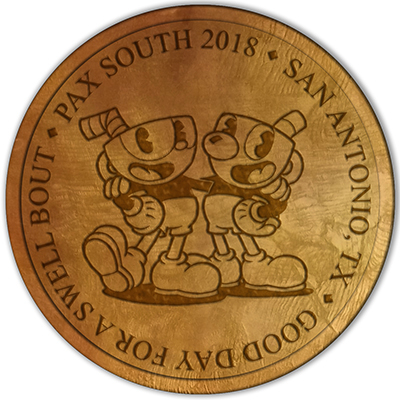 It is about that time of year again to discuss the PAX South 2018 Challenge Coin!!!!! Last year, we had a reeded edge, an Antique Silver finish, and was a 1.75 inch size. Our location was The Convention Center and the gaming side was the Konami code, which you can see here. I am open to any suggestions on the aspects of the coin. We can also decide to do two coins again or just regular or just colour. Last year, I invited people to submit photos for a chance to win a coin. Only one person sent me an e-mail and it was of a statue that's near the convention center. 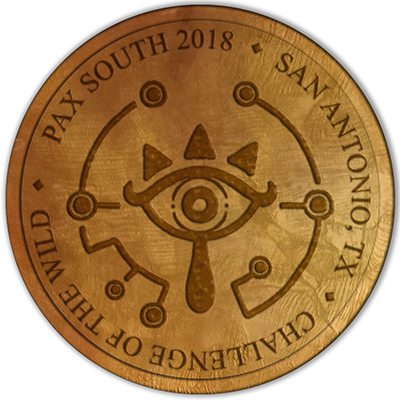 So, from now until 8pm CST Sunday evening, you can message me an image from San Antonio that you feel would make a good image for the location side of the coin. I will then set up a poll. The Tower of the Americas and The Alamo were used on the first and second South coins respectively. @RILMS Sure thing...I will be in SA next week, so it will be sometime late next week. Question: I don't think we can send large image attachments on here, so if you want to PM me your email, I can send them there. I'll also try to think of some other landmarks (like the other missions - other than the Alamo) that might work. Thanks! @SutibunRi The boots are there, and while they are 'stereotypically Texan', hardly anyone wears those anymore in the cities of Texas, such as San Antonio. The city is much better identified by the rich cultural mix that exists there today. The riverwalk is a great example of a singular 'tourist attraction' where most of what is great about San Antonio blends together. It is especially awesome in winter time when they hang lights from all of the trees that line the river's edges. It's too bad that PAX is just a few weeks past when the night lights are a thing. I believe they turn them off shortly after new year, otherwise it would be a great thing for fellow PAXen to see. @RILMS Sure thing...I will be in SA next week, so it will be sometime late next week.  In the mean time, if you have any ideas for the Gaming Side, please suggest! The next step is obviously the Super Konami Code. Can we just get Bucees on a coin somehow? It's all anybody really needs. If there are any major game releases coming out around then, that could be a theme. I read somewhere that there is a new Goldeneye coming? We also have the new SNES Classic Mini that just released. That could be a thing. It would be cool to throw a nod to some emu-gaming - perhaps something like a MAME cabinet or Raspberry Pi Retro-pi machine? 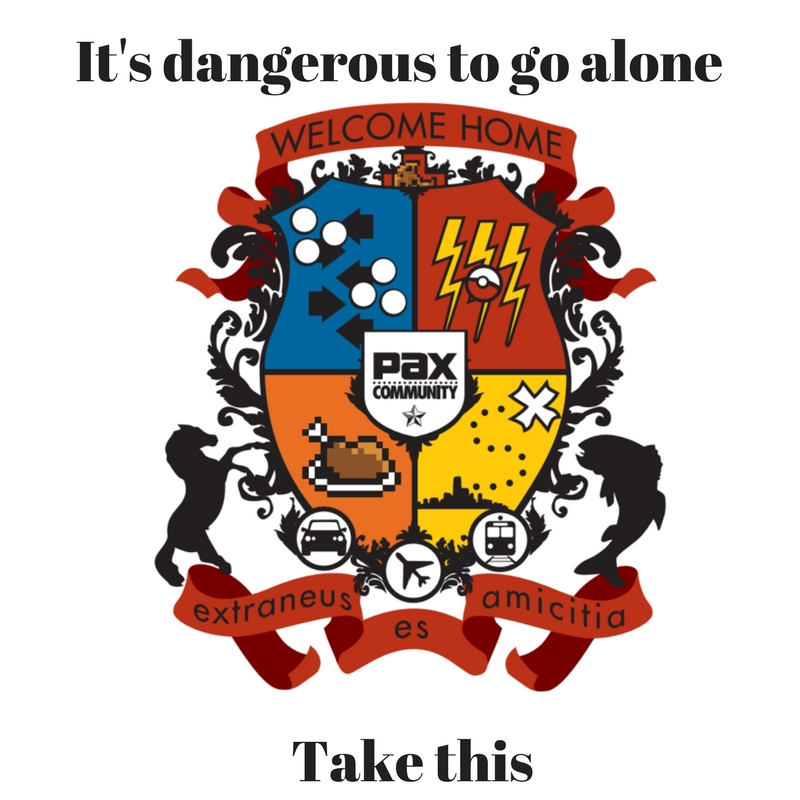 What about having "Would you kindly", a Mario Star, or the PAX coat of arms? What about having "Would you kindly"? Sure - do we have a major Bioshock release coming soon? Or maybe one just passed? I don't follow that game too closely. TBH, today I mostly play retro games, any Final Fantasy that comes out (not online), and some fun Switch games. YAY!! I love my challenge coins. Excited to see this thread. It's dangerous to go alone! Take this...coin. lol, I like this. Don't know what is allowed to be put on there, but could have the "Take This" quote and then have link holding up a challenge coin maybe. I see all kinds of shirts and posters that have that iconic "holding up" pose with whatever item places are focused on. Just as a FYI, I have not posted a poll for the location photos yet because one community member asked for a deadline as they will be in San Antonio this week. I will put up a poll for it next week. Tossing in the idea of something Cuphead / Persona related. Phantom Thieves Logo or Cuphead on one side. Lazy Suggestions I mocked up. I'm sure someone could do more/fit more on there to make them worthwhile. My lazy mockups feel empty. I haven't played BotW, but I suspect it would make a good coin with the right effort put in. I have a HUGE fan of the "Take this coin" quote, and some type of Zelda image/reference. those suggestions are very pretty! However, I don't believe the community has permission to use copyrighted imagery from the copyright holders. 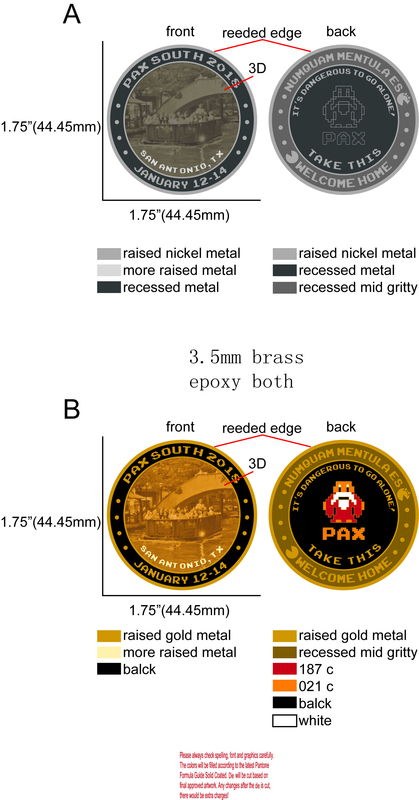 Generally the coin organizers and the community have tried their best to potentially reference something rad that might be copyrighted without using copyrighted imagery. I had a suspicion the copyright would limit what could be done. It would be cool if someone could get the official OK, but with Cuphead already having deals with vendors I don't see that happening. I wonder what else could be done. I have a deep hatred of the meeple shape, but I'd toss that out there as well, as a board gaming icon. Looks like it's been done, before, too. Maybe something JRPG/DND? Overwatch/Heroes of the Storm, maybe. Idealy, I'd like the words to bend with the shape of the coin, but I couldn't figure out how to do that. But, what do people think of this? Looking forward to these! I think all the pics are great! Also, @RILMS, that crest is rad. I am looking forward to the coin as well!! With 67 people responding, Option 3 has won with 77.6% of the vote!! Dang. 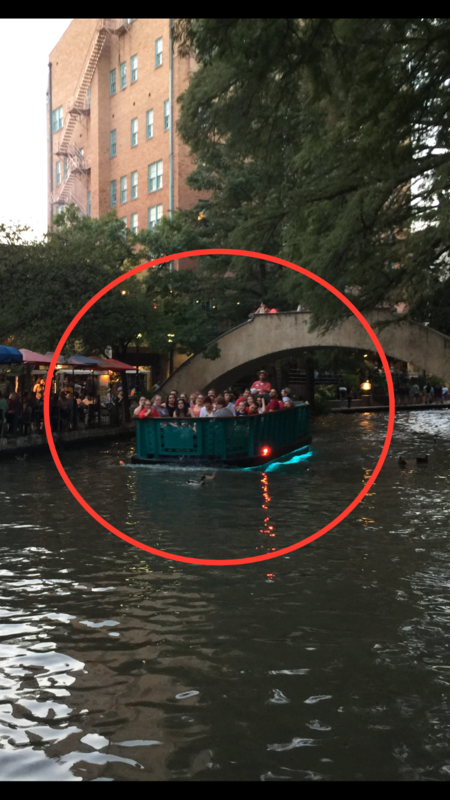 We already had the Riverwalk in the picture of the Convention Center last year. I almost would like something generic like the state of Texas or the Texas Flag. After all, it's PAX SOUTH, not necessarily PAX San Antonio. So, I don't think it would be a bad idea to do something not specific to San Antonio. Oh well, we already took it to a vote. When we get to the videogame side, if we can't get too specific like putting Cuphead on there, maybe just have a picture of different controllers- an old Atari joystick, a typical modern controller, and a VR headset? Mouse and keyboard? I suppose so, but it was really focused on the convention center. Gold for one, silver for the other. Would be fun to have two separate to make people want to buy one of each. Too alike and people might just want one or the other. 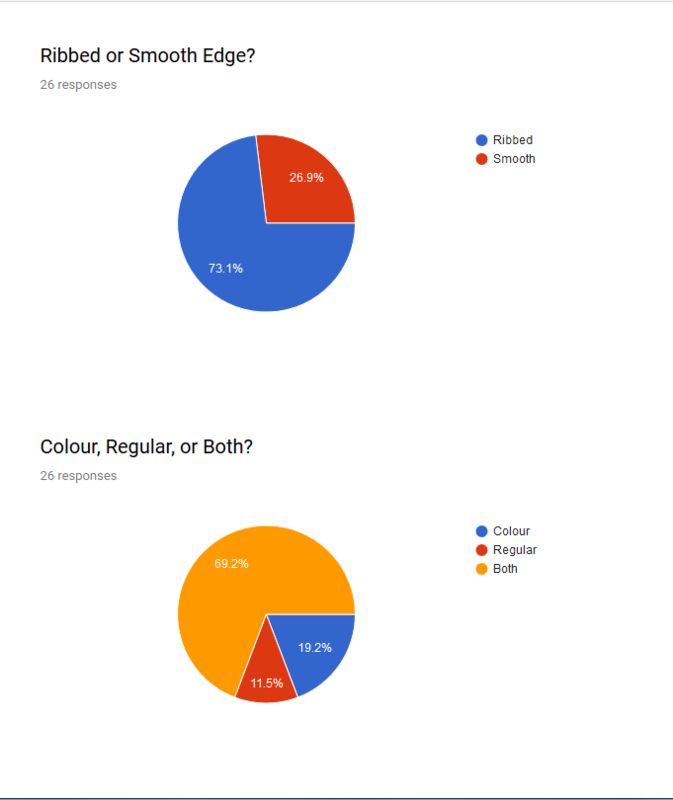 I would say a new survey with Gold, Black Nickel, Silver, and Chrome. Have people to pick a first, second, and third choice, and tally points (3 for a first choice pick, 2 for a second, 1 for a third).